Stainless Steel Measuring Cup & Spoon Set 8 Pc Just $6.99 (Reg. $9.95)! You are here: Home / Great Deals / Amazon Deals / Stainless Steel Measuring Cup & Spoon Set 8 Pc Just $6.99 (Reg. $9.95)! Head over to Amazon and order the Stainless Steel Measuring Cup & Spoon Set 8 Pc Just $6.99! (Reg. $9.95) Prime members and orders of $35+ get FREE Shipping! A Must-have for any Well-equipped Kitchen! This ChefLand Measuring cup and Spoon set provides Accurate Measurements of ingredients for all your Cooking needs. 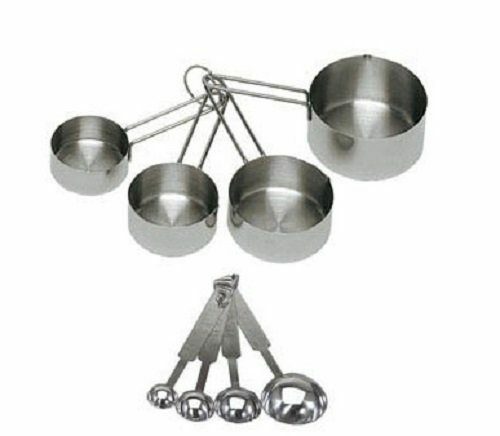 Made of Heavy-duty stainless steel, this set will not rust and is made for both liquid and dry ingredients. Features a secure insert ring and hang-friendly handles!